So we’re gonna outsource dog breeding too? We have long known that when it comes to dogs, the term “pet overpopulation” is a misnomer, and that we’ll most likely be facing a shortage of dogs in the near future — more potential owners than there are dogs available. For the millions of American households that won’t feel complete without the companionship of the “family dog,” this could be a serious problem. So how do we head off this impending shortage at the pass? Well, one blogger has an idea! Just import them from foreign puppy mills! 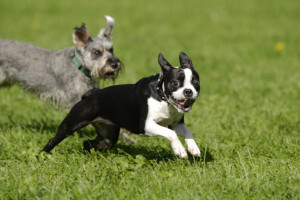 […] we should look at an alternative strategy, which was employed by the high-end coffee industry, where American interests (private and non-governmental organizations) work with foreign organizations and countries to institute basic humane standards for animal welfare as it applies to breeding of dogs. Rather than an import ban of questionable utility (given all of the ways that commercial breeders/distributors can sneak dogs over the border in large volumes), why not target four to five countries and provide them with tools to enforce meaningful animal welfare standards and best practices? 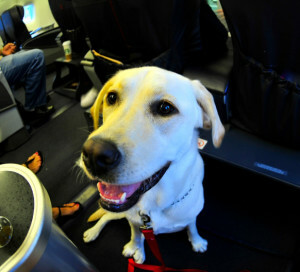 You can be sure that dogs imported into the U.S. for resale will not be flying first class. People love animals, and they are going to get pets from one source or another. Nobody is questioning that. So the challenge of meeting that demand with dogs from humane, responsible sources is very real. NAIA opposes the importation of dogs into the United States for resale, and finds the notion of sourcing our dogs from foreign breeding operations to be ludicrous. We have to ask if the author really believes that the breeding of pets domestically, raising standards where need be, and sourcing dogs locally is so taboo that mass importation from foreign, large-scale kennels actually sounds reasonable? Or is this the work of a provocateur — the author just softening us up with an assault on the senses so great that we’ll be receptive to something that makes sense in the next installment? At least for the first question, let’s hope not. To assure the future availability of healthy, humanely raised pets in the United States, we need to look closer to home. Contact us at NAIA for solutions! It’s already been a hot week, and in many U.S. cities the temperature is expected to go over 90 degrees Fahrenheit today. How are your pets holding up? Are they staying hydrated? Do they have a safe, shady place to cool down? What about limiting exertion and keeping paws off of hot pavement (and for heaven’s sake, no “quick” trips to the store with the dog left in the car)? Are you staving off boredom with games and training/mental exercises for your pets? There, now that should do the trick. Looks like the elephants at the zoo have the right idea. * special note for science and progress enthusiasts: while these shots are cute, they pale in comparison to what is currently being built. Come back in 2015 for a much more impressive pool — state of the art, 50 feet wide, 10 deep, filtrating 160,000 gallons of water several times a day, that all 8 of the zoo’s elephants can enter at the same time! Some activists claim that a police officer shoots a dog every 98 minutes, while people in law enforcement often call dog shootings a rarity, and lament the fact that there is never as much (if any) outcry when a person is shot. Where does the truth lie? There are currently no accurate nationwide statistics available for police officers shooting dogs, but we know it does happen, and any time it is avoidable, it is too often. Last weekend, there was a protest in Salt Lake City, Utah over the shooting of a Weimaraner inside a fenced yard, and earlier this year in Filer, Idaho, things became heated enough to spur a recall effort (which failed), after a police officer shot a disabled man’s dog during a child’s birthday party. After responding to a residential burglar alarm Thursday morning, Sgt. 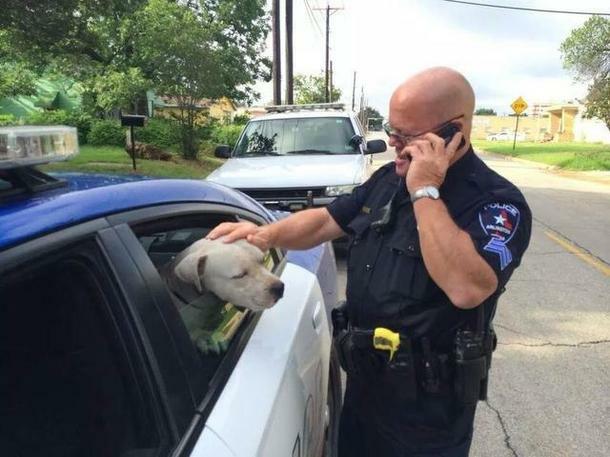 Gary Carter and Officer Heather Gibson were flagged down by some residents walking in the 400 block of North East Street who reported that a dirt-covered, white pit bull was chasing them in an “aggressive” manner. “This dog is so vicious, please get him,” one woman reportedly yelled to the officers. Carter and Gibson coaxed the hungry and thirsty canine into a patrol car with a protein bar and some head scratches. The Arlington Police Department implemented mandatory training two years ago to help officers identify the difference between aggressive and nonaggressive animals and know how to respond in situations when a dog is inside a home or roaming freely in a neighborhood. People in the neighborhood were scared and calling for help, saying the dog was “vicious” and “chasing” them. The officers, who had received the mandatory training recognized that the dog was in fact, merely dirty and hungry, and deescalated the situation in a humane, touching manner. Sometimes, it just takes a little bit of knowledge to save a life; we hope to hear more stories that end like this as more police officers receive training in how to properly deal with domestic animals. 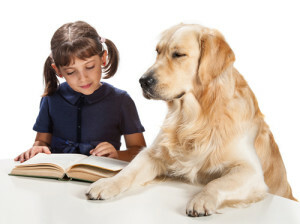 Most kids love dogs, but not all kids love reading aloud. For some children, reading in front of adults or peers makes them extremely anxious or embarrassed, and can contribute to them falling behind in reading fluency — a very dangerous road to go down. A student who can’t read on grade level by 3rd grade is four times less likely to graduate by age 19 than a child who does read proficiently by that time. But again: most kids love dogs. So here’s where Ghost, a champion show dog and great listener comes into the story. Ghost’s owner Dawn Eliot-Johnson brings him to Harrison Elementary School every two weeks, where third and fourth-grade students read to him as he dutifully listens (and often sleeps) while curled up beside them. Ghost, along with many other dogs across the country perform this duty for kids who could use a bit of help reading aloud, and it’s not just a fun break from classroom routine… it works! Kids who were once too shy or embarrassed about their skill level to read out loud are blossoming. They know that Ghost just wants to listen to a good story — no criticism, no corrections. It doesn’t take long for fear and anxiety to go out the window. The idea is simple: it’s a privilege to read to a dog. Instead of reading aloud while focused on avoiding mistakes, they’re reading to an adoring, completely non-judgmental audience. Reading becomes a positive, rather than nerve-wracking experience; they gain confidence and an enjoyment in reading, which in turn improves comprehension and fluency. The dogs love it, too: it takes a special, gentle dog who doesn’t just tolerate, but truly enjoys children to thrive in this setting. 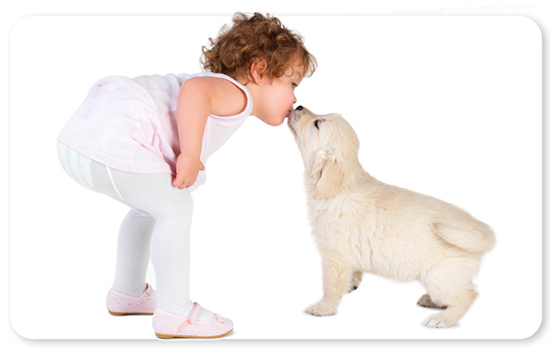 And as a side-benefit, it also serves as a great opportunity to teach children another life-skill: how to behave safely and respectfully around dogs. Win-win! Dogs often make the best listeners! Having kids read to pets to avoid anxiety and fear of judgment by adults or peers is not a new tactic — groups like R.E.A.D. and Reading with Rover have been around for years, but in case there are still any doubters out there, research is now demonstrating an improvement in reading fluency, showing that they’ve had the right idea all along. The world of animal welfare can be such a battlefield at times, it would be a shame not to look up from the trenches from time to time to celebrate great ideas like this! A recent story about a natural foods market’s run in with a local activist neatly illustrates the point that when it comes to the animal rights mentality: that it’s never really about the level of care, but ending animal use by humans altogether (and yes, this includes owning pets). Since becoming a target, animal rights activists have harassed the Local Grocer owner, given her store negative online ratings, and their ringleader has received a no-trespass order. All small potatoes in the scheme of things, but a clear and timely example that no matter how high your standards are, no matter how well you treat your animals, it is not enough. “Why not do it the best way we possibly can?” said Chase. This is an important point to remember for everybody who lives with and works with animals: whether you farm, breed dogs, run a lab, or simply enjoy owning pets, the end goal for the animal rightist is not to improve you, but to stop you. So keep treating your animals as well as you possibly can, take pride in the knowledge that you are ethical and caring and have given your all, and make sure you are operating on standards you agree with, standards set by people who actually work with animals, not those opposed to animal use altogether. Everybody knows that responsible pet owners spay or neuter their animals. 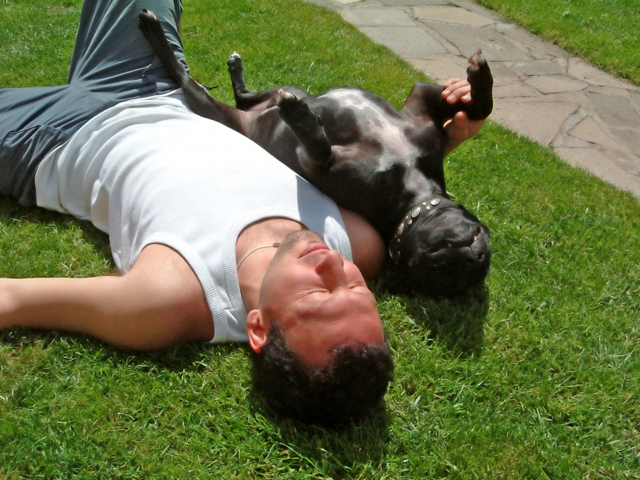 Everybody knows that responsible pet owners do their best to ensure their pets live long, healthy lives. The above statements are part of a paradigm we have been following for decades: in many parts of the country, you almost never see an intact animal unless somebody is specifically planning to breed their pet. And pet owners strive to ensure their companions’ long, healthy lives, each year spending more and more time and money on medical treatment, new food options, toys, even psychiatric prescriptions. So what happens as more and more new information is uncovered that says spaying and neutering animals may not be the best way to ensure the longest and healthiest life possible? What are responsible pet owners to do when this cognitive dissonance has been foisted upon them? Joint disease, cancer, and behavioral issues? Ovaries might mean a longer life for my pet? This does not jibe! 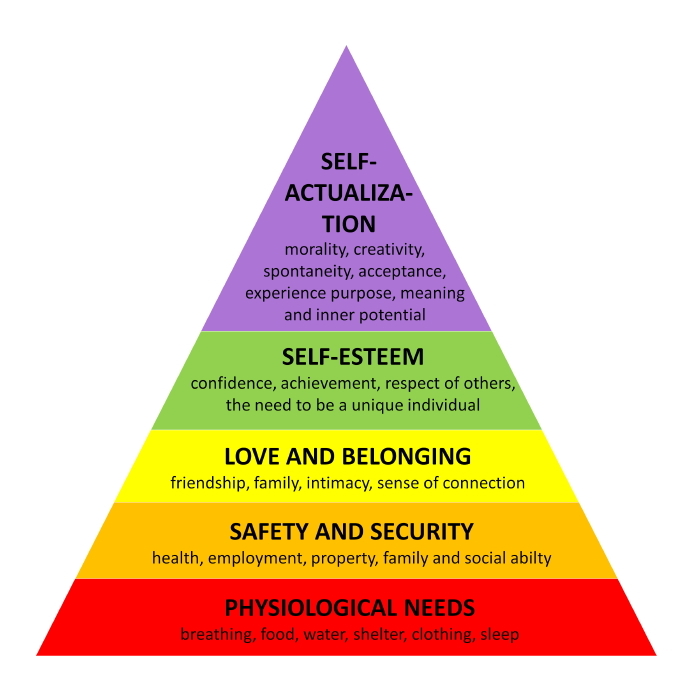 This is an issue that only pops up around the edges of pet ownership right now: you generally only hear about it from people with an interest in veterinary medicine, the “granola” crowd, or trainers and agility enthusiasts with an interest in structural health. But it is not going away,* and is an issue that will have to be addressed and reconciled by casual pet owners eventually. Finding the best way to transition from the paradigm of “Everybody knows that responsible pet owners spay or neuter their animals” to “Everybody knows that responsible owners manage their pets to ensure that they do not create unwanted litters” is going to be an important task in the years ahead. No paradigms here. Just a good romp in the field! * in fact, “Long-Term Health Risks and Benefits Associated with Spay / Neuter in Dogs” which was published in 2007 is one of the most visited pages on our website, and continues to grow in popularity. Here is a provocative take on rescue transports (what we refer to at NAIA as “humane relocation”) from Animal Ark that was published several months ago. And, lets face it: long-distance “rescues” are much more dramatic than local ones. It is easier, therefore, to get high-profile PR for them, like this spot on Anderson Cooper about a celebrity who paid to have dogs flown from California to a no kill shelter in New York. Note: While it is nice the rescuer flew the dogs to a no kill shelter in New York, no one seems to wonder why the no kill shelter took the animals, instead of simply driving over to New York Animal Control to rescue more dogs from death row there? You can bet that the PR for both the “rescuer” and the receiving shelter had a lot to do with it. This is so obvious, but a point that isn’t made often enough — you have heroic people who drive or fly all day, and brave dogs on a journey from likely death into a loving home — it’s so much easier to put a face and story behind a dog you adopted from 1,000 miles away than a dog you simply picked out from the local shelter. And oftentimes, these dogs with the great backstory are marketed as being smaller (read: more desirable for many adopters), and you can pick them up with less paperwork and hassle than you can from the local rescue or shelter. Which is great for the dogs that are being transported… not so great for your local dogs who still need homes or for solving problems at their source. They searched the house for five hours, snooping through her checkbook and wallet. Eventually they charged her with 66 counts of animal abuse, mainly because several of the dogs’ water bowls were dry. In fact, Decker said, she was so concerned for the dogs’ health that she used a water filter so her pets wouldn’t have to drink the water that mere humans drink. At first the SPCA demanded she pay $68,000 in fines, she said. Then they lowered that demand to $15,000, but “they wanted to take all my pets kill all of them but two of them,” she said. “This was straightforward extortion by racketeering,” she said. SPCA officials declined to comment on the case. Paying them off would have been cheaper than fighting them, but Decker fought anyway. She hired attorney Justin Loughry to build a case with a long list of witnesses who would attest to how Decker babied her dogs. Earlier this month, the Moorestown municipal prosecutor dismissed all of the charges. It was quite a victory, but “I’m $120,000 in debt,” Decker said. She’d like to sue the SPCA but doesn’t have the money, she said. She is certainly not the first person to have charges dropped but still suffer under the crush of enormous legal fees. And it’s not just against individuals. We’ve got large animal right organizations forking over tens of millions of dollars in a settlement with Feld Entertainment after a huge, frivolous lawsuit and an “essentially paid witness,” we’ve got animal rights activists posing as farm workers, going so far as to abuse animals in order to “maintain their cover.” We’ve got animal rightists making us wonder if there is any point at which the ends don’t justify their means. Unfortunately, Decker’s case is not surprising or hard to believe at all. 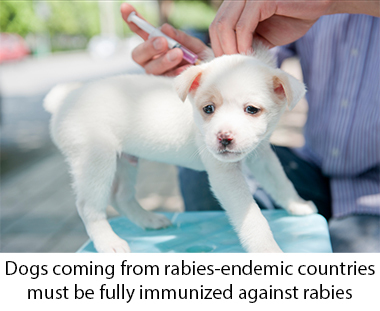 A health alert has been issued by the Centers for Disease Control and Prevention (CDC) regarding the increasing number of dogs being imported from rabies endemic countries with questionable documentation. fully immunized against rabies. However, upon examination, these animals were found to be less than 4 months old and sometimes as young as 4-8 weeks of age. Documentation has also included falsification of birth location and breed registration. Clearly they are seeing a lot more than honest, innocent mistakes. One of NAIA’s longstanding campaigns has been to awaken the public to the threats posed by the irresponsible importation of animals into the American pet marketplace — especially from countries still suffering from diseases and parasites that have been largely eradicated in the United States. NAIA appreciates the attention the CDC is giving this matter, and looks forward to the publication of the finalized USDA rule outlying the importation of dogs less than 6 months of age for resale (which includes transfer by adoption).